A new national design playbook offers exhaustive research that reaffirms the very principles behind Collective Impact Lincoln. At Civic Nebraska, we think a lot about space. Not the sun-and-moon-and-stars kind of space that requires the work of a rocket scientist to reach, though it is splendid to look up at the night sky once in a while and ponder just what’s out there. Nope, down here, we’re focused on much more local spaces, the spots where we earthbound humans tread. And more specifically, we ruminate about the important role landscapes play in shaping our commitment to our neighborhoods, to our communities, and to our world. Neighborhoods are engines of democracy. That’s a fact. A citizen-driven society can’t exist without civic engagement, and civic engagement can’t easily happen without public spaces that encourage and invite person-to-person connection. In an age of multi-lane thoroughfares, iPhone addiction, and urban expanse, the importance of well-built neighborhoods to our overall civic fabric can be easily overlooked. We launched Collective Impact Lincoln in 2017 with Nebraska Appleseed and the South of Downtown Community Development Organization to preserve the capital city’s civic health. CIL connects with residents of core neighborhoods, gathers information about hyperlocal issues that matter most, and then helps emerging neighborhood leaders tackle them. We know it’s the right path forward – which was reaffirmed this week by the Center for Active Design. 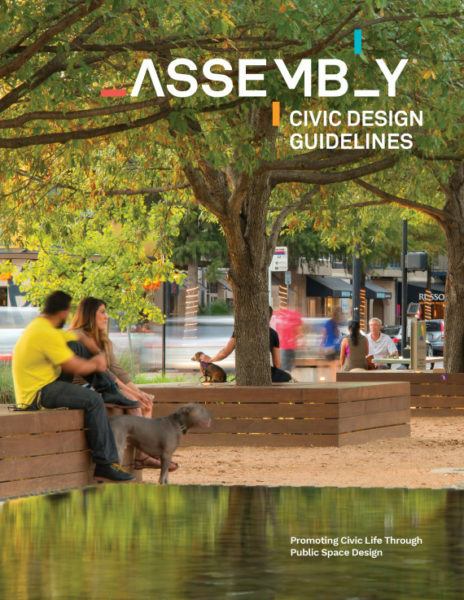 CfAD has just published Assembly: Civic Design Guidelines, a practical tool to designing and maintaining public spaces so that they are not only eye-pleasing, but also build engaged, active citizens. The playbook offers evidence-based design and maintenance strategies to create cities where people trust each other, have confidence in local institutions, and actively work together to address local priorities. Those community characteristics should sound familiar — Civic Nebraska’s Civic Health Programs reference them all the time. It’s how we measure the strength of a community’s civic fabric: What is its social connectedness? Its confidence in institutions? Its overall community engagement? Its political involvement? Block by block, city by city, these attributes uphold democracy across our state. Assembly puts even more solid research behind what we’ve been hearing from our community conversations, during deep canvassing as well as through series of Community Builder Workshops throughout the spring and summer. We’re reflecting upon “tactical urban” initiatives such as green spaces, mini-parks, bike lanes, walkable spaces, reliable public transit, gathering spots, welcoming signs, and better lighting. These aren’t radical notions — but CfAD’s exhaustively researched guidelines confirm to us that Collective Impact Lincoln is definitely on the right path. These days, America feels like an increasingly polarized place. People don’t trust the government, corporations, the media, even their neighbors. Assembly provides empirical evidence that the design and maintenance of our neighborhoods impact our feelings of trust. When we focus on the public spaces that we experience every day, we can start re-building trust at the local level. Like Civic Nebraska and Collective Impact Lincoln, Assembly draws that direct line between accessible spaces and healthy democracy. For example, research shows that people who walk frequently tend to report higher levels of civic trust and participation, so make neighborhoods more walkable. Research shows better public transit is directly connected to higher voter turnout, so make sure public transit excels. A mix of housing types supports demographic and economic integration and reduces concentrations of poverty, so work to have a mix of housing across the city. Even actions as straightforward as local farmers’ markets, community clean-up days, and collectively caring for vacant lots are proven to grow confidence and civic pride. It doesn’t require millions of dollars to invest to strengthen your community. You can get involved in a range of ways. Contact Collective Impact Lincoln to learn about ways you can support the initiative. And save the date for our next Community Builder Workshop, which will Saturday, Oct. 13. As we look back at the first year of Collective Impact Lincoln’s existence, we can’t help but think of one of our Civic Nebraska rallying cries: Democracy starts in our streets, in our schools, and in our neighborhoods. The path to a more modern, robust democracy goes directly through our communities. That, as another popular saying goes, is not rocket science. It just takes hard work.